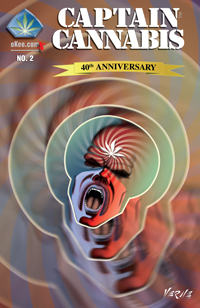 Captain Cannabis brings the spirit and creativity of the nineteen sixties and seventies underground comic book revolution into the 21st century. Created in the seventies by comic artist and animator Verne Andru this isn't your run-of-the-mill mainstream comic book fare. Join along as a stash of intragalactic-weed transforms love-stuck slacker Hal Lighter into superhero Captain Cannabis on a mission to save planet Earth from itself! The story is a brilliant mix of highbrow comedy and adventure with the rough and tumble sensibilities of the wrong side of the tracks. Captain Cannabis is a breath-taking roller coaster ride with awesome characters adventuring in an inspired universe. A unique blend of science fiction and dark comedy, it's a tale that will keep you riveted! Captain Cannabis No. 1 - Creator Verne Andru proudly presents the world-wide release of the one that started it all! 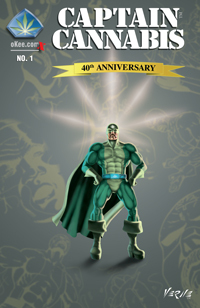 This 40th Anniversary edition brings the art, characters and story from the 1970's original into the 21st century making this edition the best of the best. Features the original "Roll Me Another One" starring Hal Lighter who, after smoking some of the good stuff, transforms into superhero Captain Cannabis to ... well you'll have to read the book for that. Captain Cannabis No. 2 - "Roll Me Another, Just Like The Other" picks up from No. 1 taking you on a roller-coaster ride of fun and action that'll leave your head spinning. Just like the Captain's! A 40th Anniversary release, this issue sees Captain Cannabis facing his innermost demons while babe-Marion's resolve is put to the test. New art with updated story. Verne's "Angel" science-fiction adventure returns with six previously unpublished pages with George Freeman on inks. Captain Cannabis in 420 - Playing off Captain Cannabis's 4/20/1977 creation date, Verne published the later part of his Captain Cannabis epic as 420 in 2006. Based on Verne's Captain Cannabis feature screenplay, this premiere issue picks up Hal and Marion some years after their adventures in the current Captain Cannabis series. This story is being incorporated into upcoming issues of Captain Cannabis making it highly collectable so grab a real copy while you can. 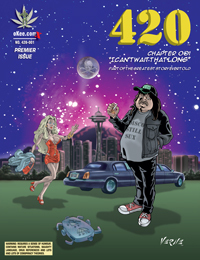 Free 420 Comic Book available for download here.